The Android’s Dream reads something like an SFnal James Bond spoof by way of South Park. 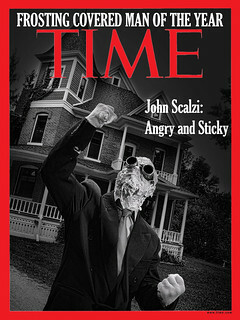 Scalzi isn’t exploring anything particularly deep thematically here; the name of the game is satire, and he does some of the most spot-on political wit this side of the old British sitcom Yes, Minister… [it’s] just the right gene-splicing of fast action and furious comedy SF has been needing for ages. 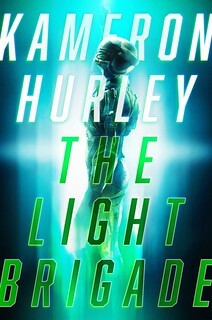 I’d also commend you to read it as an example of how to write a longish review without giving away too much of the plot; there are a couple of points in the book I want to keep as a surprise for the reader, and it’s not necessarily a sure thing reviewers are going to keep those plot points under their hat. So it’s always nice — both as an author and as someone who reviews things — to see people making an effort to let surprises stay surprises while at the same time giving enough information for a useful review. It’s a skill, it is. Oh, dear. Science fiction writer Mike Ford has died. Making Light has more details. I’d met Mike Ford on a number of occasions and had a panel with him at the most recent Boskone; we were friendly and he was a good friend to a number of my good friends in SF. I admire his writing and his whimsical spirit. I have two of his books on my shelves. I think I’ll read one today. That’s the best tribute I can give to a writer, I think. Addendum: Elise Matthesen, Mike Ford’s companion, shares a remembrance.